Kerouac hints at pot smoking at the beginning of Desolation Angels (1965), when he travels to Mexico to visit “Bull Gaines” (William Burroughs, a streetcorner philosopher/junkie that Kerouac turned his college buddies Allen Ginsberg et al onto in Times Square). One of Gaines’ diatribes described in Desolation Angels spanned the Epic of Gilganish (sic), Minoan civilization, Petronius, Mallarme, and HG Wells’s history of the world. 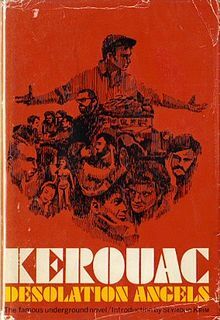 “I had my little wines, lesser drugs of my own (for excitement, for sleep, or for contemplation, and when in Rome),” Kerouac wrote. Any doubt that he was talking about marijuana is erased when “Irwin Garden” (who wrote “Howling”) and his buddies appear: “Whenever I rolled a joint they smoked it without a word.” The group would argue about Samsara (this world) and Nirvana (no world) and Heidegger.